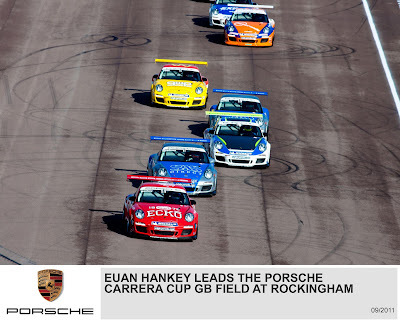 Euan Hankey (Taunton) set the seal on his victory with a peach of a start to lead the impressive field of 450 hp 911 GT3 Cup race cars through the banked Turn One and into the tight Deane Hairpin. In his wake were the three key title contenders; Michael Meadows (Banbury) slotted into second and Stephen Jelley (Leicester) briefly dived ahead of James Sutton (London) to take third. But in the scrum at Deane on the opening lap, Sutton drove boldly around the outside of the bunched cars to regain third place. While Hankey edged his lead out to around three seconds, Meadows was secure in second but life was anything but settled for Sutton in third place. Having squeezed ahead of Jelley on the opening lap, Richard Plant (Sheffield) set about challenging Sutton for the final podium position and chased the SAS-liveried car for lap after lap. “Richard kept me honest all through the race,” said Sutton, who was only able to put space between himself and Plant late in the race. 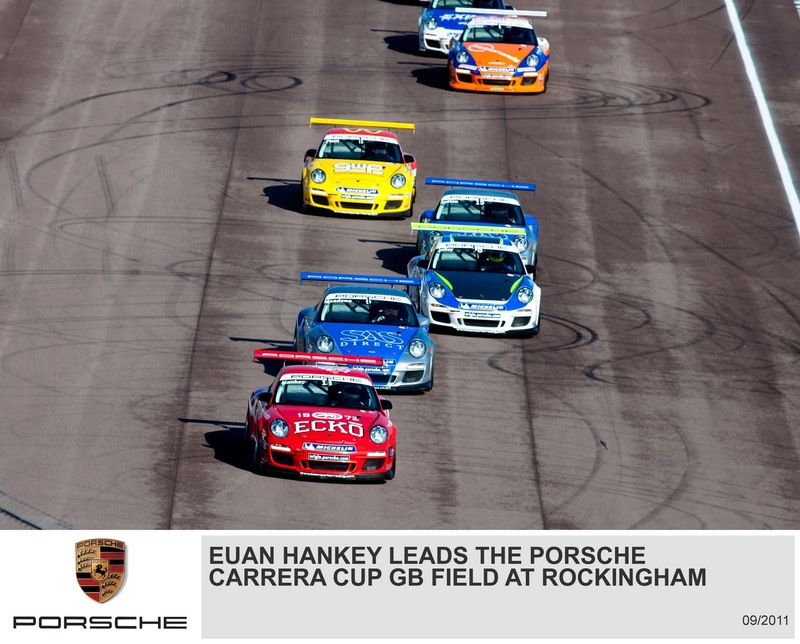 “Our pace was good all the way through,” said Hankey after a clear run to victory. “Massive thanks must go to Team Parker Racing.” For Meadows, second place and fastest lap maintained his Championship lead. “I just need to keep doing this,” said Meadows. Sutton completed the overall podium from the impressive Plant. “I couldn’t get past Sutton, but I can’t knock that result,” the Yorkshire driver said. Jelley ran fifth, but gradually dropped away from the battle between Sutton and Plant, while Kieran Vernon (Sussex) continued his strong qualifying form to take sixth place. Gelzinis always led Pro-Am1, but in overall terms he challenged Vernon and, at the same time, battled to fend off Ben Hetherington (Hulme Walfield). On the final lap, Hetherington, the 2011 Porsche Carrera Cup Scholar, attacked at Tarzan and, after contact, Gelzinis ran wide and lost the place. Hetherington was later given a time penalty to reverse the positions. “It was more or less okay, but on the last lap he touched me,” confirmed Gelzinis. There was drama in the battle for the other Pro-Am1 podium places as Derek Pierce (West Kilbride) came back from a first lap knock to fend off Ahmad Al Harthy (Oman) and Alex Martin (Somerset). Eventually, contact from behind put Al Harthy out with a rear puncture and then, on the last lap, contact between Martin and Pierce sent them both spinning. All of that opened the door for George Richardson (Nether Alderley) to nip through to second as Pierce recovered to salvage third. “I had a slow front puncture and I was just nursing it home,” admitted Richardson. The unfortunate Rory Butcher (Kirkcaldy) ran a secure second for much of the race before being forced into the pits with a rear puncture. Ozbek drove a faultless race to win Pro-Am1 for the first time. “It was a good clean race,” he said. “I did not know where to be on the first lap, but I survived!” With George Brewster (Edinburgh) delayed after being tipped off on the first lap, Steve Parish (London) fended off the closing Keith Webster (Liphook) to complete the Pro-Am2 podium. 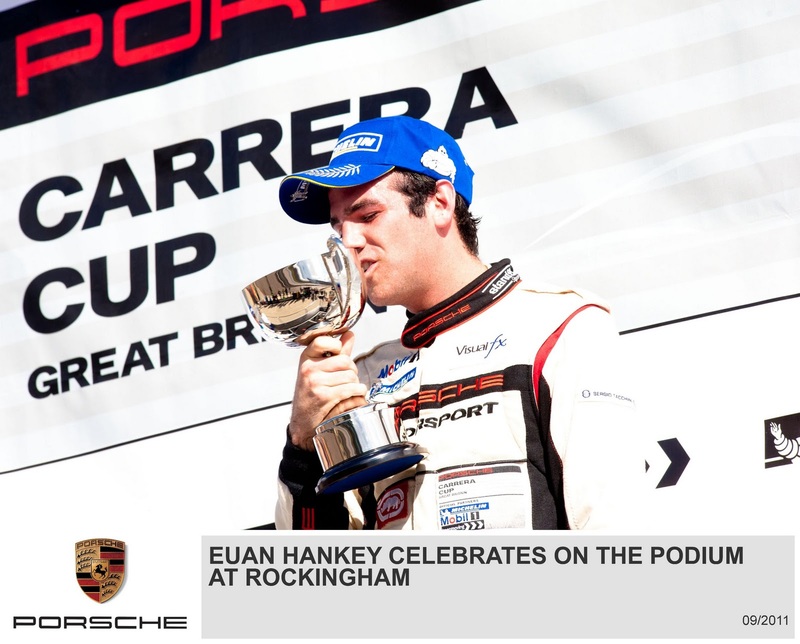 Hankey completed a perfect weekend with his second race victory in the space of a little over three hours. In a race full of superb racing and fierce contests, Gelzinis completed a Pro-Am1 double and Ozbek took his second Pro-Am2 win of the day; his fighting performance earned the Turkish racer the ‘Driver of the Weekend’ award. Parker with Juta took the ‘Team of the Weekend’ award. Once again, Hankey shot off the grid to lead the opening lap, but Sutton’s commitment through the first couple of corners saw him jump into second place from Jelley and Meadows. As Hankey and Sutton pulled clear, they ran neck and neck for much of the race and later in the race Sutton almost dived ahead. As many as five cars ran in close formation for third place as Jelley bagged the final podium position from Meadows, Gelzinis, Plant and Hetherington. “That was better than the first race,” said title contender Jelley. “I’ve got to push hard at Brands Hatch,” he added, referring to the penultimate weekend of the season. Meanwhile, Gelzinis completed a double win in Pro-Am1. “I’m happy to be in the top five overall,” said Gelzinis, who was always in touch with Meadows. For once, Pierce had a clear run to take second in Pro-Am1 from eighth overall as Al Harthy completed the Pro-Am1 podium. “A lonely race is a good race,” said Pierce, who has had his share of dramas in recent races. 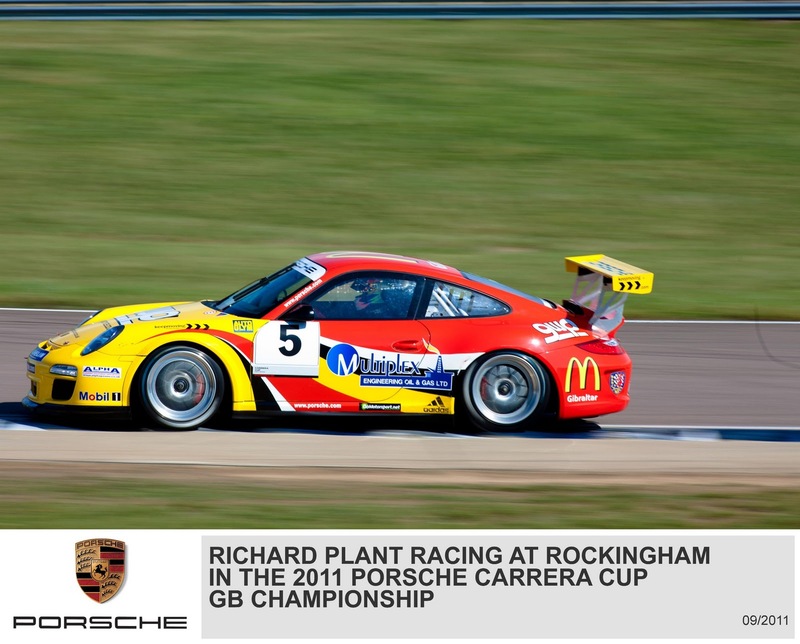 Motorbase Performance racers Richardson and Daniele Perfetti (London) took fourth and fifth as Perfetti had one of his best weekends to date in the Carrera Cup GB. 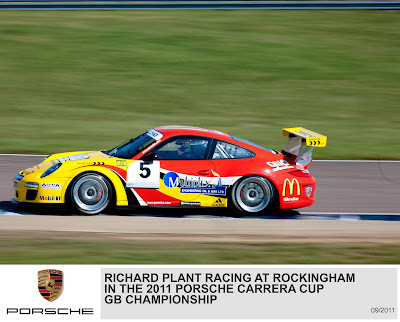 The next round of the Porsche Carrera Cup GB Championship takes place at Brands Hatch in Kent on October 1-2.